If you have your credentials you are using to login to your eWay-CRM in Microsoft Outlook, you should be able to sign in to eWay-CRM Mobile. If you are experiencing some issues, please see the text below. We are sorry. Your eWay-CRM Mobile License is not active. Mobile access is not set as active for your user in Administration Application. You are using eWay-CRM Free. The mobile app is supported for eWay-CRM Premium only. Please upgrade your account first. You are using eWay-CRM Free but eWay-CRM Mobile is available only for users of eWay-CRM Premium. If you want to use eWay-CRM Mobile, please upgrade your eWay-CRM to Premium version. Login credentials are invalid. You type in incorrect username or password. We are sorry. The server is not responding correctly. Please contact eWay-CRM support team. Application cannot connect with server. You can also experience the error when you are using HTTP authentication on your server (e.g. Windows Authentication) and you are using eWay-CRM lower than 5.1 - in this case, you only misspelled credentials (Windows Authentication needs user name without domain, so you type in only "username" not "DOMAIN\username"). If you do not know whether you are using the authentication, please contact your administrator. We could not find the eWay-CRM web service. Please, check your internet connectivity. Web service could be misspelled when you type it in your eWay-CRM Mobile, or the web service does not exist. The other cause can be that you are offline. Some public WiFi needs you to go to the internet browser and accept its conditions. After this acceptance, you will be online. Connect to eWay-CRM only on your company WiFi (via local network). Use VPN tunnel to company network. Administrator may try to set remote accessibility of the server via internet. The error may also happen when the domain name is not same as server name on HTTPS certificate. The issue will remain until the domain name will be same as server name on HTTPS certificate. For more information, go to How to Correctly Work With HTTPS Certificates. We are sorry. The number of active eWay-CRM Mobile Access users exceeds the license. Your eWay-CRM has not enough licenses for all users who want to use eWay-CRM Mobile. You can change the setting of licenses in Administration Application to set licenses only for currently active users, or you can buy additional licenses. If you do not have permissions to Administration Application please contact your eWay-CRM administrator or our technical support. We are sorry. The number of active eWay-CRM Outlook Access users exceeds the license. Your eWay-CRM has not enough licenses for all users who want to use eWay-CRM in Outlook. 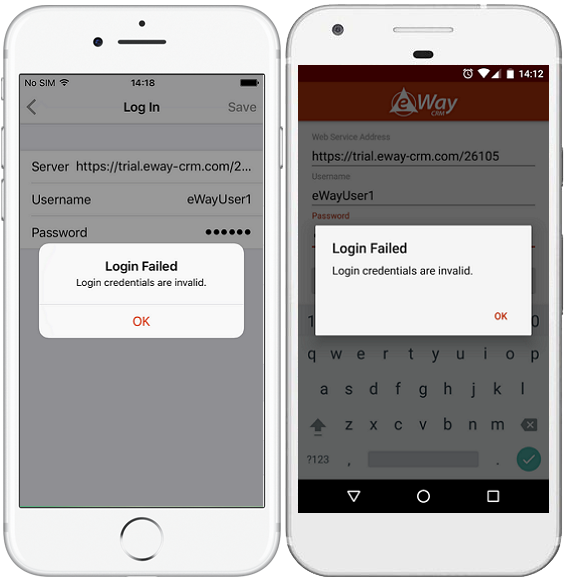 It can cause inaccessibility of eWay-CRM Mobile. You can change the setting of licenses in Administration Application to set licenses only for currently active users, or you can buy additional licenses. If you do not have permissions to Administration Application please contact your administrator. We are sorry. The number of active eWay-CRM Web Access users exceeds the license. Your eWay-CRM has not enough licenses for all users who want to use eWay-CRM Web Access. It can cause inaccessibility of eWay-CRM Mobile. Android: eWay-CRM Mobile is not supported. Please contact eWay-CRM Support Team. iOS: We could not find the eWay-CRM web service. Please, check your internet connectivity. This might not be an error, your eWay-CRM just does not support the service that is necessary for eWay-CRM Mobile. Please contact our support team with a request to install this service. If eWay-CRM was available on your server previously, please continue reading. The issue can be caused by slow server. Application tries to verify the login credentials with server, but the server does not answer in time. Because of it, eWay-CRM supposes that the required service is not available. Please, try to logged in again, right away. The administrator should consider to prevent sleep of WCF service and Web Service on console for management of IIS server. Please update to eWay-CRM 4.3 before using eWay-CRM Mobile. eWay-CRM Mobile is available for eWay-CRM 4.3 and higher on Android phones and for eWay-CRM 4.4 and higher on iOS phones. If you have lower version, please update your eWay-CRM. Identity of the server was not verified. Do you want to trust this certificate? This could be manifestation of hacker attack or just incorrect server configuration. You need to consider whether the certificate is correct. For more information, go to How to Correctly Work With HTTPS Certificates. The trustworthiness of the host "servername.com" could not be verified. Do you want to continue and trust the server? Only on iOS phones. Instead of "servername.com", there will be real server name. If your server/IT administrator does not specifically allow you to do it, do not accept the notice and do not trust the server. For more information, go to How to Correctly Work With HTTPS Certificates.